You will love this one! What an amazing update this turned out to be and the client’s were so happy. You see this was the client’s grandmothers house and the family had just moved in and were starting to redo the whole house. 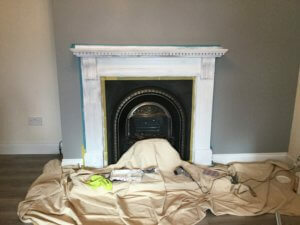 The fireplace surround, as sturdy as it was, just didn’t fit in with the modern scheme the client wanted and rather that replace it, they answered my advert looking for a surround to be painted . The reason I did a shout out was because I wanted to do a video on this particular project. 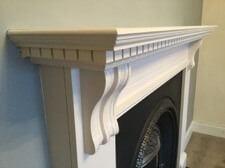 We get so many emails asking, is it possible to update a wooden fireplace surround, so it suited our new series of home decor video tutorials! People seemed to be a lot more hesitant to attempt this project and I think its because a fireplace surround is a permanent fixture in your room, unlike furniture that you can always throw out if it goes horribly wrong, am I right ??? 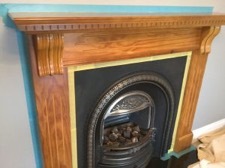 You will see from the video that not only did this paint improve the fireplace itself, but when I took the final photo, I couldn’t believe the beautiful colour that was on the walls. A colour I hadn’t even noticed a few hours before. So the lesson I learned from this project was … changing just one thing in your room, can totally enhance the whole room! Have a look at the BEFORE photo. This was what it looked like at 10.30am when i entered the house. Well first off I covered the area with a big dust sheet and then taped off the wall and the inner part of the fireplace. Yes this takes a bit of time, but it means your painting is SO much quicker. I used to be a bit lazy with my prep, but I ended up spending so much time cutting in and cleaning off paint in unwanted areas that it drove me mad ! 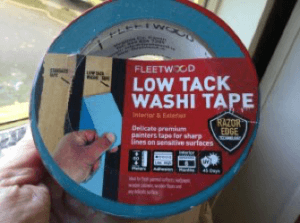 … now its Low Tack Washi Tape all the way !! lol. Trust me when i tell you, the finish you get is SO much better if you take the time to do your prep properly. The blue Low Tack Washi Tape is the one for the wall area, as it doesn’t pull off the wall paint. Well you will see from the video the step by step process, the first thing I always do with every single project is CLEAN IT. Using a 50/50 mix of methylated spirits ( de-natured alcohol for those in the USA) and water in an old squeezy bottle. 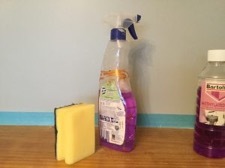 Spray directly onto the wood and use a sponge to clean it. Wipe/dry off with kitchen roll or a dry cloth. Scuff sand. On the video I show you how to make a sanding block which makes scratching the surface much easier. You are not trying to get the finish off here, just create millions of little scratches for your new paint to stick to. Prime. Now this is the single most important bit. This particular primer has super adhesion and will stick to this shiny surface and that means you will have a durable finish to your paint. 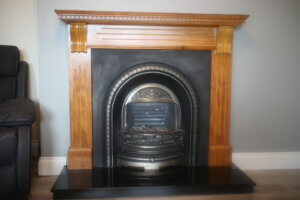 If you are going to spend the day working on your fireplace, you want it to still lovely as lovely in 12 months time. So what primer did I use ? I used a flock roller to apply the primer as it keeps it very flat. It can feel a bit sticky when you first start to use it (if you are used to only using water based primers) but that’s normal and the roller will help you spread it. I did one thin even coat and let it dry ( See photo below ) Then I applied a second coat which gave full coverage and then I had my lunch break! I applied the paint in exactly the same way. 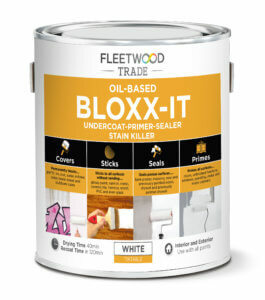 I chose the Fleetwood Advanced in the Satinwood finish as I wanted the client to be able to wash down the paint. It is super tough and durable and thee best one to use around a heat source. I have added a little more detail about this particular range below. When you read it you will see why I choose to work with the Advanced range. You can clearly see by this close up photo that the finish was superb! That is due to the prep and the products but also the superfine sanding pad. Below is a little more detail on the paint itself.